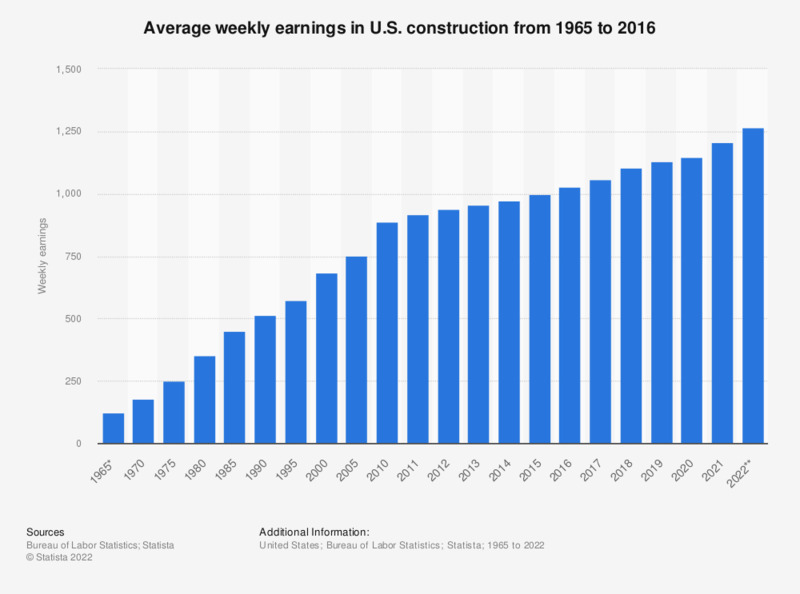 This statistic represents the weekly earnings in the U.S. construction sector between 1965 and 2016. In 2016, employees in the U.S. construction sector had weekly earnings of around 1,027 U.S. dollars. * This figure was included in the previous year's data. Figures are updated constantly. Data are projected from March 2011 benchmark levels. When more recent benchmark data are introduced with the release of January 2013 estimates, all unadjusted data from April 2011 forward are subject to revision. Numbers are annual averages and compiled by Statista. Figures were compiled from several editions of the BLS report.